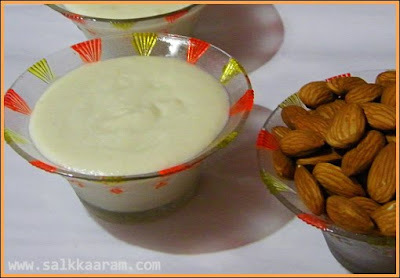 Almonds Pudding | Simple and Delicious ! Blogging becomes a burden when there are lots of other things.. 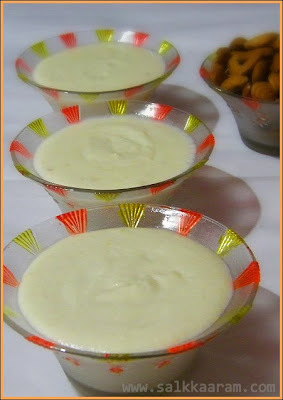 Still there are few recipes in the draft to save me.. :) Here is a simple almond pudding from the Middle Eastern Cuisine. Enjoy! Soak almonds, peel and grind it to a paste with enough milk. Blend rice powder with remaining milk, heat and bring to boil. Add pinch of salt, almonds paste and sugar into this. Stir well, until the mixture thickens. Add rose water, stir and remove from fire. Transfer into serving bowls, allow to cool. Chill and serve with crushed nuts. kind of like a firni? looks very nutritious. Salams Seena. long time since visited your blog.the pudding looks so mouthwatering. Hi seena, delicious almond pudding. gotta try sometime.. am a new blogger, do visit my space..
this looks new to me..nalla tasty aavunamlle.good for kids..
Salaam Alaikum Seena,How are you doing ? nalla pudding da...would love the rose flavour in there...pinney as u told, bloging really becomes a burden at times.....sometimes i hate it too....:)sukham alley?...no news at al..wer r u now?.. it came out really good.wonderful recipe.